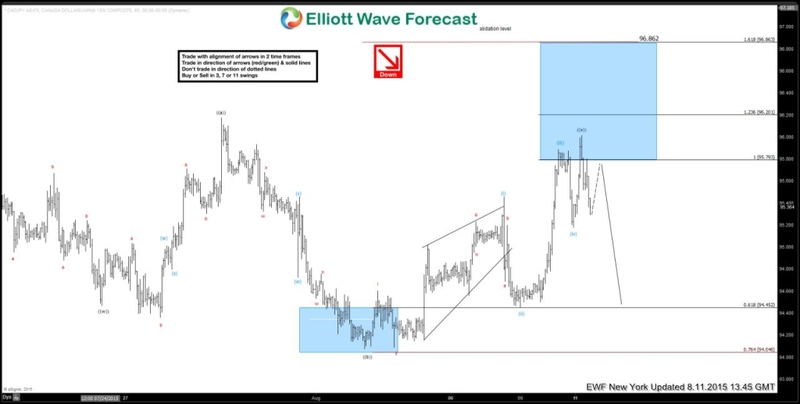 Short term Elliott Wave view suggests decline to 94.47 ended wave ((w)). Wave ((x)) bounce unfolded in the form of a FLAT structure where wave ((a)) ended at 96.17, wave ((b)) ended at 94.08, and wave ((c)) of ((x)) is proposed complete in 5 waves at 96.02. As far as price stays below 96.02, and more importantly below 96.86 which is 1.618 extension of wave ((a)) and ((b)), the pair is expected to resume lower or at least pullback in 3 waves to correct the rally from 94.08. We don’t like buying any proposed bounce.